In this study, the structural behavior and performance of the dapped end beams with composite section under effect of static and repeated loads was investigated by experimentally tested and included ten simply supported beams with dapped in one of ends. The parameters that have been taken into consideration represented by studying the effect of reparation longitudinal tensile reinforcement by steel sections, effect of repeated loads, different types of composite steel sections, and influence of increased the shear span to depth ratio (a/d) more than one on the composite dapped end region. The study focused on determining the first cracking load, ultimate strength (Pu), deflection at service and ultimate load, failure mode, load-deflection behavior, ductility ratios, and crack pattern at failure load. 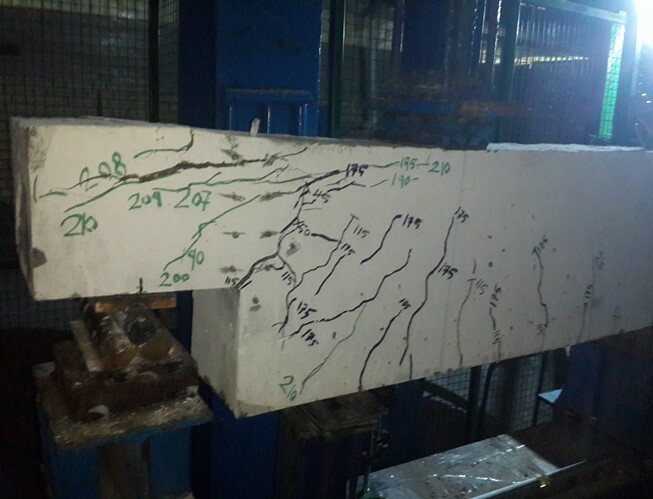 The results presented that using the composite I-section instead of normal section in dapped end beams developed the shear capacity for dapped end region and enhanced the first crack appearances about 33.33, and 39.42 % for shear span to depth ratio 1.0, and 1.5 respectively.